Culver City, California is full of charm and plenty of successful businesses. It is a great place to live, and it is the kind of place where people take pride in what they do. Companies that supply the growing industry in Culver City need to be experts in what they do and offer the highest level of support. 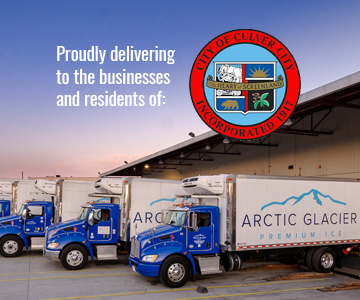 This is why Arctic Glacier is a premier ice delivery provider in Culver City. We work directly with many types of businesses throughout the city to make sure that everyone who needs ice, gets it. Good ice made by professionals looks, feels, and even tastes different than ice made from municipal tap water. Culver City businesses are not going to pay for ice they could make themselves. This is why Arctic Glacier works hard to make the highest quality ice in the area. Our process starts with the cleanest water available, and then we use special filtration methods to remove even more toxins. The end result is crystal clear ice that is excellent for any application. It takes a dedicated ice manufacturing company to supply the many different needs of a place like Culver City. We work hard every day to meet those demanding needs. We can meet the specialized needs of any Culver City business without crushed ice, dry ice, classic square cube ice, and standard ice products. If you are having a special event, then let us dazzle your guests with one of our expertly crafted ice sculptures. We have the ice Culver City needs, and we understand how important that ice is to everyday life. Our process for delivering high-quality ice products does not stop after we make the ice. Our professionals use refrigerated trucks set the precise temperature to keep your ice clear and fresh. If we did not know how to deliver your ice, then you would not get the high-quality products you expect. Our associates can work with you to help determine how much ice you need on a regular basis to run your business. Then we will help develop a delivery schedule that keeps your freezers full and allows your business to stay productive. During those moments when you unexpectedly run out of ice, we will use our emergency delivery service. Our number one goal is to make sure you have the ice you need to keep your clients happy. There is a lot that goes into event planning, but you can just leave the ice requirements to us. We can service any size event, and we will make sure that you have the ice you need right when you need it. From a large outdoor gathering to an indoor customer appreciation event, we will make sure that you have the kind of ice you need. Also, we make sure you always have the right amount of ice. Culver City is a fun and energetic place where suppliers are expected to be the very best in the industry. Arctic Glacier fits that description and that is why we service many of the businesses in Culver City. Call us today and let us help you get your ice needs under control from day to day, and let us help with any special events.